Arturo Vidal, Charles Aranguiz and Eduardo Vargas (from l. to r.) have all been included in Chile's 23-man Copa America squad. 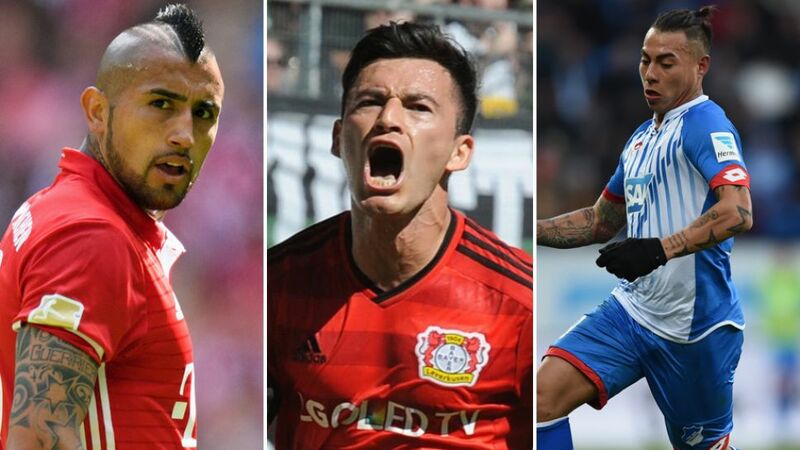 Three Bundesliga players have been selected in Chile's final 23-man squad for the upcoming Copa America Centenario, which kicks off in the USA on 3 June. Coach Juan Antonio Pizzi named largely the ensemble as the one that lifted the title on home turf last summer, and called up FC Bayern München's Arturo Vidal, Bayer 04 Leverkusen's Charles Aranguiz and TSG 1899 Hoffenheim's Eduardo Vargas. Former 1. FSV Mainz 05 defender Gonzalo Jara and ex-Hamburger SV midfielder Marcelo Diaz are also included. Chile will begin the defence of their crown against Argentina in Santa Clara, California, on Monday 6 June, before facing Bolivia and Panama in their remaining Group D encounters.